Add the convenience of an elevator to your home and enjoy a more relaxed lifestyle, while increasing your home's value with a touch of luxury. 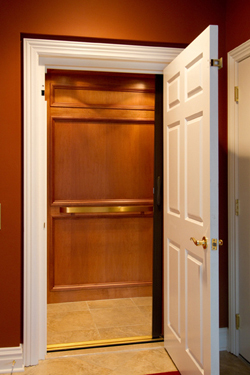 Our full featured home elevators come in a variety of sizes and configurations. With openings available on 3 sides we can meet any application with an efficient use of space. Our automatic car doors/gates provide convenience while available glass wall panels provide an unobstructed view. Our fully finished wood cabs (constructed using all wood species) provide an elegant look at an affordable cost. 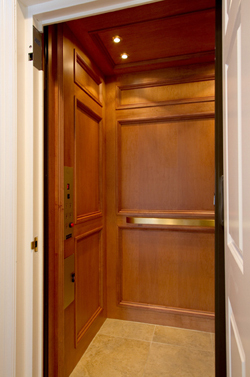 With a wide variety of trim and fixture finishes, we can coordinate your elevator with any home décor. Our compact controllers, drive units and machine room-less designs take up minimal space providing more usable living area. Recessed telephone compartment, battery operated lowering and many safety features provide piece of mind. Focusing on service beyond the sale, we provide our clients with superior products and our warrantees prove we stand behind our work and assure a quality installation. Our commitment to quality control, code compliance and unique craftsmanship offers our customers the most dependable, safe and attractive elevator system available, adding to the overall appeal of the home that will last a lifetime.